Upon selecting our first president of African descent, many pondered the impact President Obama would have on the black male youth. However, as a black woman, my question was how a black woman as the First Lady would impact black femininity? Lets first consider the traditional role of the First Lady. The position of First Lady has always been a staple in American femininity. The First Lady was always extensively educated, a fashion icon, an advocate for social cause and maintaining the family unit. A black woman as the first lady asserts the black female as a contemporary token of womanhood. Traditionally excluded from the bounds of womanhood, a black First Lady not only showcases an alternative to being black, but shows a new way of being a lady. Mrs. Obama as the First Lady has resulted in the rise of the Angry black woman stereotype. Every candid photo is seen as an opportunity for the media to portray Mrs. Obama as attitudinal, sour, and therefore undeserving of her position. This angry black woman stereotype has also been a means to create a false resentment between Mrs. Obama and women of the majority. For example, perhaps you remember the meme that went viral earlier this year that featured President Obama, the First Lady and a woman of the majority. The images on the meme features an image of president Obama seated with a woman of the majority and Michelle seated next to the woman as well. 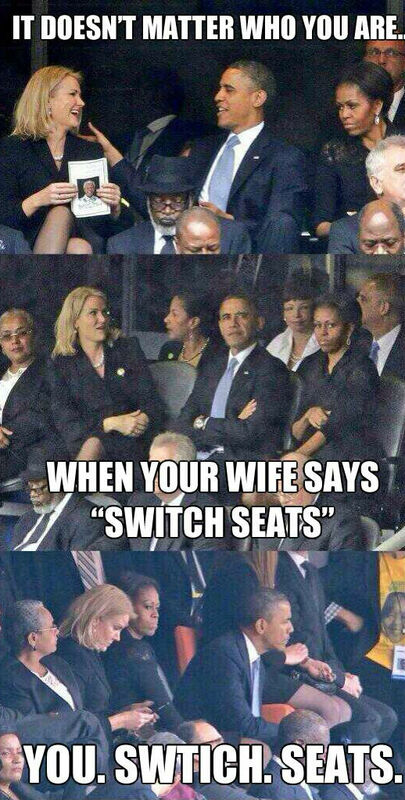 The second photograph features the first lady between the two with a stoic expression captioned: No matter who you are, when your wife tells you to switch seats you switch seats. The photos that went viral implied The first lady’s anxiety around a white woman, whereas the true photograph reveals that Mrs. Obama actually switched seats so that President Obama could take a photo with this woman. Thus, the media took this an opportunity to not only depict the first lady as stoic and angry, but as a threatened by a white woman. This reveals anxiety with a black woman in a high place, as seemingly implying that first lady is insecure in the face of white women. Inadvertently attempts to subjugate the confidence of the black woman by placing the white woman on a pedestal, whereas the actual photograph displays kindness and confidence on the part of the first lady. While black females bodies have always been present in the white house, Mrs. Obama marks the shift from the black woman as a servant to delegator. This shift has been of great influence, but also of great ignorance. The First Lady has been criticized for her weight and eating habits by men of the majority. While their efforts were designed to criticize Mrs. Obama, they have served as a source of shame for all black women. The comments reveal an uneasiness with black female presence in a position of power. Her body is described as “too big” encompassing the fragile male ego that is reduced by the eminence of her presence. 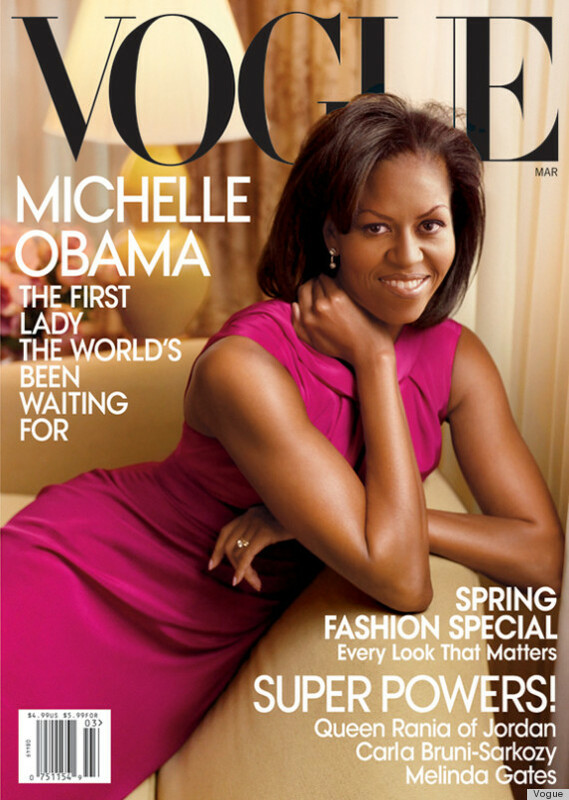 Mrs. Obama as the cover feature of Vogue Magazine was undoubtedly one of the highlights of my life. A black woman on the cover is a feat of its own, but to see one of such caliber sets the bar of black femininity up where it should be. Raising the bar of black femininity means a deviation from black women as entertainers. Black women have been entertaining long before they could even walk through the front door, or be seated in the front row. While I do not wish to denounce the impact, struggles and triumphs of the black entertainer, I will say that there is a degree of comfort with blacks as entertainers. Blacks as entertainers has mirrored a master/slave dynamic in which the labor of blacks is exploited for profit. But, perhaps more importantly blacks as entertainers have allowed for areas such as academia, law and politics to be largely dominated by the majority. The First lady defies the tradition of the black entertainers, soiling the comfort of blacks as entertainers by encompassing the irreversibility of education, and the influence of popular culture. As a black woman, admirable role models are few and far between. While First Lady Michelle Obama has unveiled an anxiety surrounding the poised and professional black woman, she has also shown that there is a place for them. From healthy eating campaigns to Vogue, Mrs. Obama has combined achievement and humility to represent the contemporary black woman. As the epitome of class, Mrs. Obama has risen above all criticism by simply being above it.